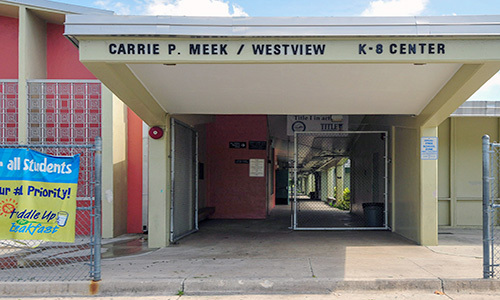 On behalf of the administration, faculty and staff of Carrie P. Meek/Westview Elementary School, we welcome you. At Carrie P. Meek/Westview Elementary, we are committed to developing problem solving, critical thinking, reading, and writing skills in all of our children. To accomplish these goals, it is imperative that teachers, parents, and administration frequently converse on the progress of our students. Therefore, we invite you to visit our school and the Parent Resource Center, in order to enhance the relationship between the community, home, and the school. Additionally, the Parent/Student Handbook provides useful information concerning the rules and regulations of the school and the Miami-Dade County Public School Board. Let's work together! It takes an entire village to raise a child.